Sienna X tanning is one of the best tanning products on the market today. Sienna gives you a FLAWLESS, NATURAL and SUN-KISSED GLOW. Deep tissue massage uses firm pressure and slow strokes to reach deeper layers of muscle and fascia (the connective tissue surrounding muscles). It’s used for chronic aches and pain and contracted areas such as a stiff neck and upper back, low back pain, leg muscle tightness, and sore shoulders. Massage for Pregnant Women is a massage therapy specifically tailored for the expectant mother’s needs. The mother’s body is properly positioned and supported during the massage to ensure comfort and safety for the mother and baby, Certain massage techniques are modified for the purpose of Post Natal Massage or Pre Natal Massage depending on the stage and state of the pregnancy as well as the health of the mother. Pregnancy Massage has been found to introduce relaxation and reduce stress, decrease swelling in the arms and legs by increasing blood and lymph circulation, relieve aches and pains in muscles and joints especially in the low back, hips and legs. Hot Stone Massage has to be one of the most enjoyable and relaxing therapeutic massages available, designed to work on muscle tension at the deepest level. 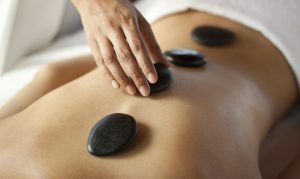 Smooth lava stones are heated to a comfortably warm temperature in a special stone heater before being used to massage the body. The heat is deeply relaxing and helps warm up tight muscles. The heat of the stones penetrates deep into the muscle tissue allowing the muscles to relax 4-5 times quicker than in a standard body massage, easing muscle tension and revitalising the muscle tissue by increasing blood circulation.